Lock snapping is now the primary way thieves are getting into Doncaster homes. The great news is together we can beat the thieves by installing anti-snap locks and protect your family and home for the long term future. Lets stop making it easy for the thieves. Call us now for a great price and service. In the Doncaster area lock snapping is a major problem. Practically every burglary now commited in the borough where access has been gained unlawfully is through this procedure. These locks can be found on all upvc doors and also some composite, wood, sliding patio and aluminium doors. They are made mainly of brass which is non corrosive. This helps because little or no maintenace will ever be needed. But brass is soft and within the structure of the lock there is a weakened area. With a little force and knowledge this can be exposed and the lock pulled out and the locking mechanism can then be opened. Social media has not helped this secret and videos on how to do this can frequently be found on You Tube! How do we know which one's we have? You don't to be honest. I have heard of Police advising that if your locks are over 6 years old then they will be the vulnerable ones, wrong! Even brand new properties being built today are not guaranteed to have antisnap locks fitted. There is no obligation or insurance requirement for antisnap locks to be installed. Good locksmiths will be able to advise if they are but to be certain, the lock itself will need to be taken out and examined to be absolutely sure. The good news is that we can beat the thieves easily. SF Locksmith can exchange your existing weak locks for the brilliant high security anti-snap versions. When fitted they will not change the appearance of your door. These features will ensure your future protection and keep your home, family and you safe. If the euro cylinder itself is fitted flush to the handle on the outside the thief will firstly break the bottom part of the handle. This method can be also counteracted by the fitting of high security handles. We call these "pas 24" handles. When fitted, they create a barrier around the lock and this prevents any access to the weak barrel. They also have the effect of making thieves think twice about attempting a breakin and go elsewhere. They can not be fitted to all doors but do fit a large proportion of doors out there and look great as well. The combination of an antisnap lock and pas 24 handle set will give the ultimate protection against any unlawful entry. 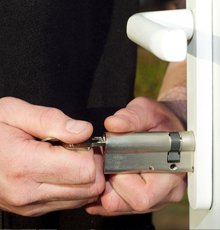 For more information on anti-snap locks in Doncaster contact SF Locksmiths now.